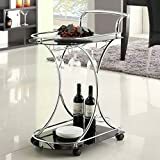 LYKE Home Contemporary Wine Cart – My Home Wine Bar ! Amazon Price: $115.12 (as of January 30, 2019 4:39 am - Details). Product prices and availability are accurate as of the date/time indicated and are subject to change. Any price and availability information displayed on the Amazon site at the time of purchase will apply to the purchase of this product. Serve friends and family in style with the LYKE Home Contemporary Wine Cart. This cart features a unique contemporary style with a polished chrome finish and accenting black tempered glass shelves to complete the look.